I was working on the recipe and a next post but don't feel that it's coming out the way I want. So, I decided to leave it until I am able to comprehend better all things around me. Today was the D-Day, the dentist day, and I had my wisdom tooth removed. My left brain hemisphere, along with face, mouth, etc., is numb and malfunctions. However, I didn't want to leave my blog abandoned for today. I have a few pictures to share. First, is an answer to the buzzing question "What happened to that knife?" from the Kitchen Mystery post. 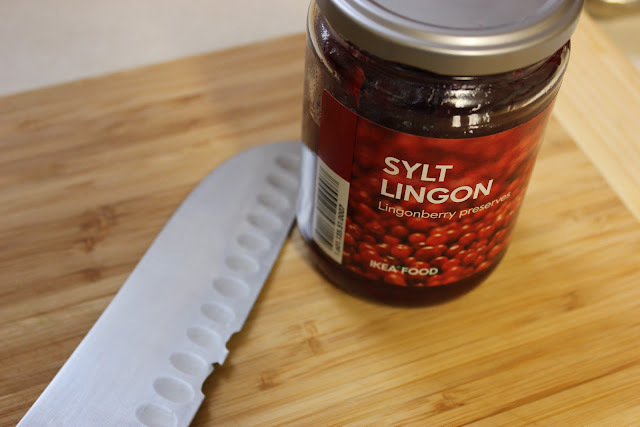 My favorite knife met a jar of Lingonberrie preserve, and couldn't handle it. Part of which common vegetable is this? Let me give you a hint: often times this part is ignored and discarded. So, what vegetable is it? Thank you for your hugs. You're right, potato is not discarded. Come back soon for a picture of the whole vegetable. What? Were you trying to open a jar with knife. Marina, Now that's interesting. hunh ! It looks like cauliflower stalk to me. 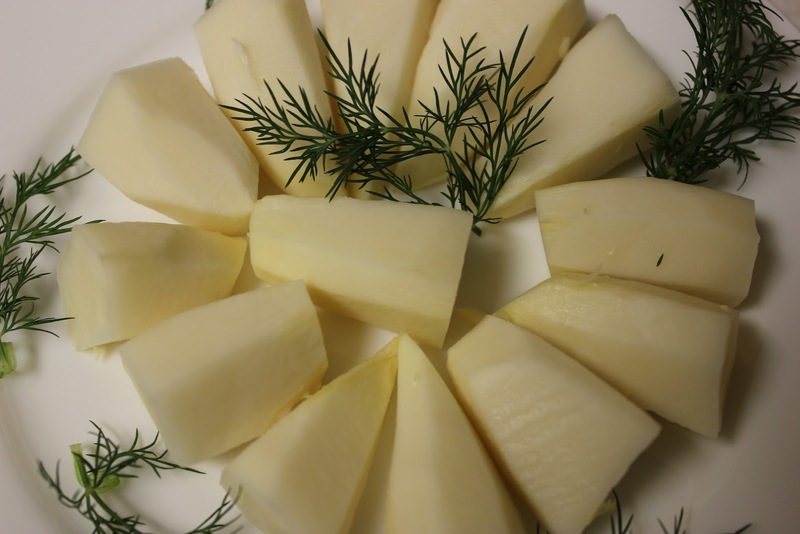 I have never peeled celery root,so not sure.Get rest, drink soup which I am sure you are making with this vegetable and dill. See you next Wednesday. Balvinder, no, I wouldn't dear to do it to my favorite knife. It was someone else. :) Thank you for your kind words, Balvinder. Thank you Suchi. Come back to see the picture of the whole vegetable. It looks like (a lot of) cauliflower stalks but I don't think they're that thin. Some sort of root vegetable...^^; Most people will tell you that I'm not the greatest guess with this sort of stuff. Have a great day, Marina! As a veggie, I am so pleased to have discovered your blog. I've never had lingonberries so I will have to look out for them. The vegetable, mmm I can't quite guess. I would have said cauliflower, but these look too neat. Sticking with cauliflowert for now. Thanks for visiting me here. I am glad you like it. Hmm, there's been a lot of cauliflower guesses but I think I'll go for something different. I'm thinking the root of something - celery root, or parsley root perhaps. Thank you, Liz. Is parsley root discarded?! For us parsley root is such a delicacy, that is hard to come by this days. That knife wasn't expensive but it was super comfortable. I already tried several knives, nothing so far works for me even close to that knife. Oh, well... Maybe it's time to go for one of those a bit more expensive Shun knives (knife that was broken I bought for $6 at TJ Max some years ago). Good guess, Ruth. However, when I posted that picture, I didn't know what was it. It took me a long talk with ... well, who did it, promising no retaliation, etc., until I was told what really happened to it...:) In the end, it's just a knife! Oh, sad knife situation :) Parsnip or jicama? But the discarded part throws me off. Now I am curious! So nice stopping by to visit with you! Thanks Lorraine! Come back for the reveal!